The all-new origin of ALAN SCOTT GREEN LANTERN – unlike any GL origin that’s come before! The debut of the all-new HAWKGIRL! And Jay Garrick, THE FLASH, meets his first Super Hero! Alan Scott is badly injured and one of the only survivors of the train crash, his over is also dead. The green energy of earth heals his body and christens him the new champion of earth with Superman gone. Elsewhere Hawkgirl checks Flash’s skills and reveals an impending darkness that’s destroying nature. Grundy is reborn in Washington at the National Hall as he sets out to destroy everything! Art- Nicolo Scott’s art hits all the right notes while being complimented perfectly by Trevor Scott’s inks and Alex Sinclair & Pete Pantazis colors. Not as dynamic or as vibrant as the colors from past Green Lantern: New Guardians books but very adequate. Cover-Alan Scott partially roasted and reborn from the flames. The alternate is the art without any form of color. Both look pretty good. Birth of a hero- The How and why of the Ring are executed very well. The symbolism of the ring and what it was originally meant to be make this an origin story for the history books! Dynamic Duo- Hawkgirl and Flash are night and day, one is skilled the other untrained, in control the other no control etc. They play well off each other and added humor to this otherwise bleak issue. Death- While the death of Alan Scott’s boyfriend will serve as heroic motivation much the same way Alex’s death motivate Kyle when he first started out, introducing a gay character and promptly killing him will no doubt cause an uproar. Just ask Geoff Johns after he killed that Arab character in Aquaman. Recycle- Um not to nitpick but that green lantern logo seems very reminiscent if not downright copy pasted from Kyle Rayner’s latter half run as Green Lantern after he became Ion. 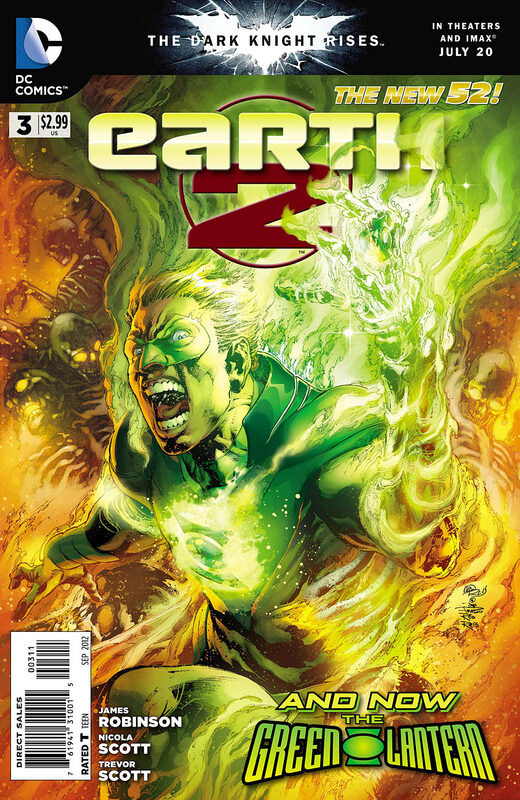 (located on the cover) AND Alan’s new costume looks allot like Hal Jordan’s Parallax costume……For shame DC!? Costume- Alan’s costume is seriously missing a cape. Design wise the suite seems incomplete ad lets face it capes add a certain regal charm to heroes who can fly…and he’s replacing superman as this earth’s premier hero so he simply must have a cape! theres a few things about this book i do like and don’t like. for one they could have took the time to come up with a more original costume for alan but they didn’t, another thing is the only reason why they use the gay plot was to try to out do marvels gay wedding. one of the major things i do not like about this book is the st8up right off the bat killing of a hero or a love one. this type of shock plot is being use to much.i’m very happy that more hero’s of color are being used in dc comics bad thing with dc is they have a history of not writeing good story lines for them let alone not knowing how to showcase them.